The headquarters building in Global Warfare is the main structure in your base. In this structure, you can adjust your tax rate to bring more gold into your city. 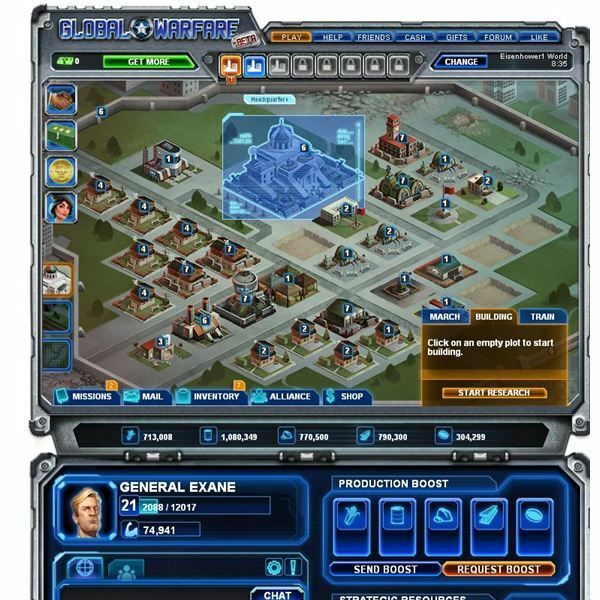 The headquarters also provides you an overview of your economic production and how many resources you are pulling in per hour. This building shows you the level of each of your current structures in the game. Upgrade your headquarters to unlock more buildings and upgrades for other structures in your base. Your base needs citizens for the army as well for the economy. Build residences to bring people into your city and to help provide more gold for your base. A higher-level headquarters allows you to upgrade your residences and bring in more people. Outside your city, build farms, oil wells, stone quarries, and steel factories for resource production. On the game map, you can acquire strategic resources such as titanium. In the university, you can train agriculture, drilling, mining, and construction to increase your overall resource output. When you build the university, you can also train other technologies that improve the speed of your troops for example. On the black market, you can buy resource bonuses for game cash. Currently you can’t trade with other players through the market but this should change soon. Build the logistics center to manage battlefield logistics and impact the speed of your army while transporting goods between cities. Your base needs a barracks and a rally point to send out troops. Each troop type will require you to build additional structures or upgrade existing ones to higher levels. With a rally point you can scout, attack, reinforce, or reassign and area on the map you currently hold such as your additional cities. To attack you’ll need to recruit a general. Build a factory, tank factory, and air traffic control building to gain access to all the different units in the game such as fighters and tanks. The perimeter around your base helps to protect you from attacks so be sure to level that and build the defense structures such as mines or artillery. 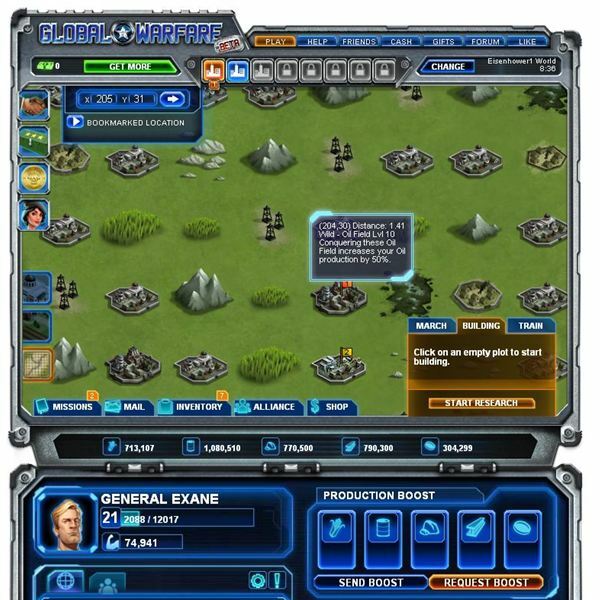 Build a general headquarters and recruit a Facebook freidn to lead one of your armies or to help your economy. The satellite station warns you of any incoming attacks to your base. Upgrade this station to help prevent your enemies from gaining detailed information on you through scouting. If you have game cash you can also buy camouflage for the station which helps protect your base from the prying eyes of your enemies. The supply bunker holds your extra resources in the game and protects them from looting. Be sure to upgrade this structure so more of your resources are protected. 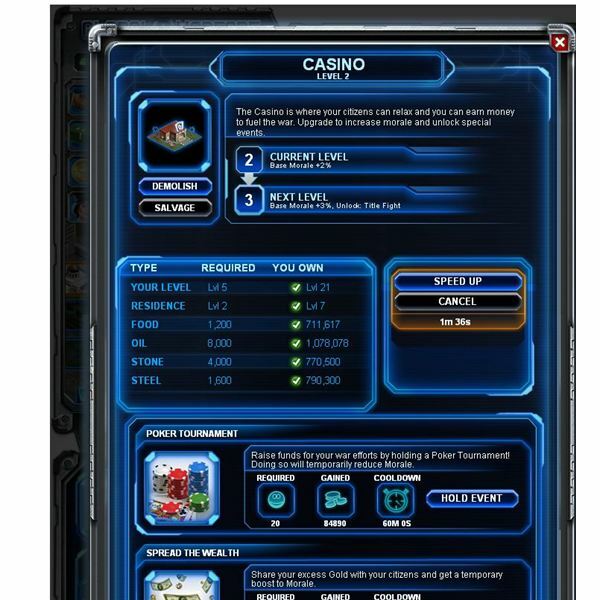 The casino increases your gold output through gambling events as well as other bonuses such as additional base morale. The research and development is a unique structure in the game. Here you can take loot acquired from battles and get rewards. For example if you collect the grain silo, wild produce, and livestock loot pieces you’ll get 40,000 food in return. You can also acquire loot pieces to build maps, which show you the location of the special strategic resources. Other bonuses include combat bonuses for your troops. 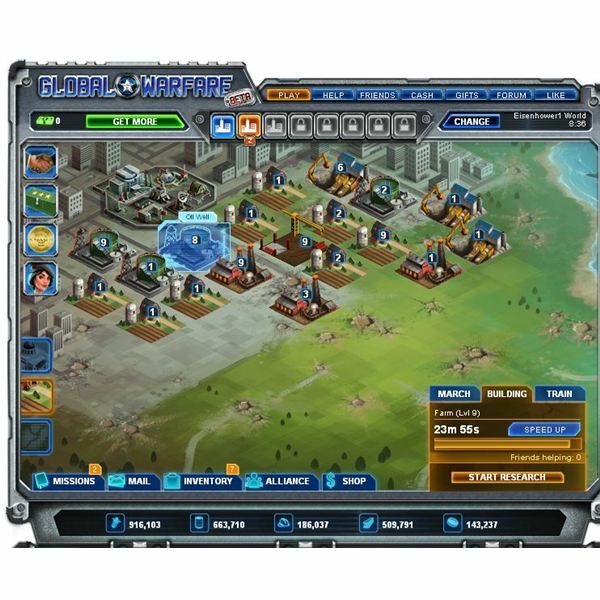 Build the distribution center outside your city to hold any strategic resources you acquire. Be sure to concentrate on your economic buildings first. You need plenty of food, oil, steel, and stone for construction. Once you build troops they will eat lots of food so make sure you have enough farms so you don’t burn through your food reserves. To gain more gold quickly use the casino and run a poker tournament. Level your residences if you find you can’t train any troops. You need spare population to make additional military units. Global Warfare is a fun MMO browser war game and this guide will get you started with the structures in the game. be sure to ask question in the game chat or join the forums if you need more help. Join an alliance to play with othe rplayers to get the most out of Global Warfare on Facebook.